Photo: This is the Delta. The roughly oblong-shaped province of Vinh Long sits midway along a large Delta island, with the Tien Giang (Mekong) river running along its northern border and the Hau Giang (Bassac) river running to its south. Lush and heavily cultivated with both rice and fruit orchards, the province is criss-crossed with canals and tributaries all flowing into the teeming rivers that form its borders. It’s not surprising that the name Vinh Long translates to “eternal prosperity”. Most travellers will spend their time in the eponymous provincial capital. While a medium-sized town, most points of interest in Vinh Long town sit in the northeast corner where the Co Chien river meets the Long Ho canal (The Mekong proper flows across the north side of An Binh). This corner of town is also a popular spot for locals to sit back, slurp coffee and scoff banh mi while the chocolate brown river waters roar past (and it does roar). This area also hosts a large wet market that borders a bustling central market, some gold shops and plenty of eating opportunities. Vinh Long is used as a base for those visiting the floating market at Cai Be (which is actually in Tien Giang province as it sits north of the Mekong River) and is also known for its homestays on An Binh to the north. While just a trickle of foreign travellers come through, compared to My Tho further downriver, the boat trips here are more affordable and the homestays offer a terrific opportunity to experience Mekong life firsthand. We believe if you have the time it is worth stopping here, though for the homestays rather than the floating market. The tours operating out of Ho Chi Minh City often hop, skip and jump through this area, combining a trip to Cai Be on the way to Can Tho so very few people overnight here—don’t be surprised when you’re the only foreign tourist wandering the streets. While travel agencies can organise homestays on An Binh and boat trips, both are significantly more expensive than organising something on a more freelance basis—walk up to the ferry to An Binh island and don’t be surprised to be approached for a homestay or boat trip with more reasonable prices. While it is a shade of its former self, as Cai Be operates well into the day if you’re in a rush it’s feasible to arrive in Vinh Long early in the morning (say from My Tho), do a boat trip out to the market and returning to Vinh Long by early afternoon with plenty of time to push onto Can Tho. Most trips to Cai Be run for at least three hours as the trip there takes about 45 minutes each way (depending on the route taken and the boat used). That said, if you are going to Can Tho anyway, we’d lean towards skipping Cai Bae entirely—though a stay on An Binh should still be considered. Vinh Long doesn’t have the tourism infrastructure of My Tho or Can Tho, but it remains a friendly and easy to navigate town. The city has a certain charm and the homestays in An Binh are refreshingly hassle-free and worth a night or two. Also, if you have your own transport, getting out into the surrounding countryside for a bit of a poke around is well worthwhile. Most accommodation can arrange bicycles or a scooter. While Vinh Long sprawls out to the south, as a casual visitor you’re most likely to find your excursions hemmed in by 30 Thang 4 to the east, Hai Thang Chin to the south, the Cau Lo river to the west and the Co Chien River to the north. Everything within this area is easily walkable and the footpaths are in not too bad shape. The riverside corner of town houses the post office (14 Hoang Thai Hieu) and most corners around the central market have ATMs. The hospital is a bit out of town on Tran Phu and unless it’s an emergency, we suggest making the trip to Ho Chi Minh City where medical care is considerably better. There is a central bus station near the market, but this serves mostly local destinations, for longer haul trips you need to head out to the new bus station which is a few kilometres out of town. A xe–om should cost around 20,000 dong for the trip. 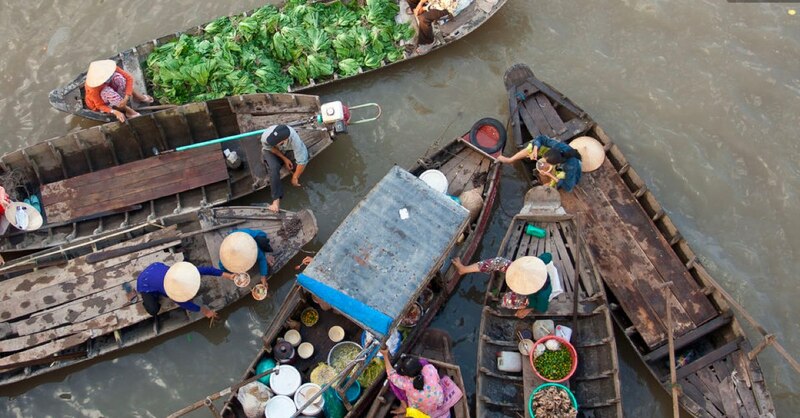 Please sign up as a Travelfish member to download the Vinh Long guide PDF (6.3 MB, 25 pages). Membership costs just A$35 per year (less than A$1 per week) and gives you access to over 250 PDF guides. Last updated on 17th September, 2018. Browse our independent reviews of places to stay in and around Vinh Long. Read up on where to eat on Vinh Long. Check out our listings of things to do in and around Vinh Long. Read up on how to get to Vinh Long, or book your transport online with Baolau. Planning on riding a scooter in Vinh Long? Please read this.  Use the above map to find specific destinations in and around Vinh Long which are listed on Travelfish. Bed icons indicate a guesthouse, hostel or hotel, the knife and fork is an eatery or bar and the four-way circular thingy marks sights, attractions and other points of interest. Click on any icon for a short pop-up and a direct link to the page for that spot. If you are in the area, use the teardrop icon near the top left to show your position on the map (you'll need to allow position sharing for this last feature to work).